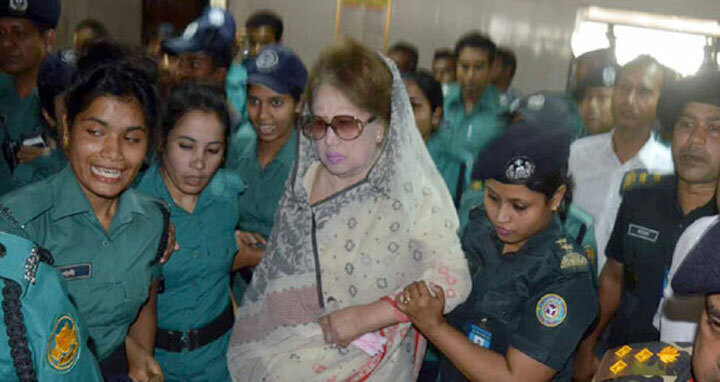 Dhaka, 7 April, Abnews: Ailing BNP chairperson Khaleda Zia was taken back to Dhaka central jail from Bangabandhu Sheikh Mujib Medical University (BSMMU) on Saturday after medical check-up and tests. Earlier, the former prime minister was taken to BSMMU from jail on an ambulance at around 11.30 am. She was offered a wheelchair to go to the cabin block on the 4th floor of the hospital but she refused and walked to the lift. Two members of a medical board earlier formed by the government and her personal physician examined her health. Later, the doctors suggested conducting some medical tests, including x-ray on her knee and two hands and blood test. After the x-ray in Radiology and Imaging department and blood test, she was taken back to jail. Khaleda’s two lawyers—Sanaullah Miah and Barrister Mahbub Uddin Khokon—met Khaleda at the hospital. The BNP chief’s personal physician, Mamun, was also present.